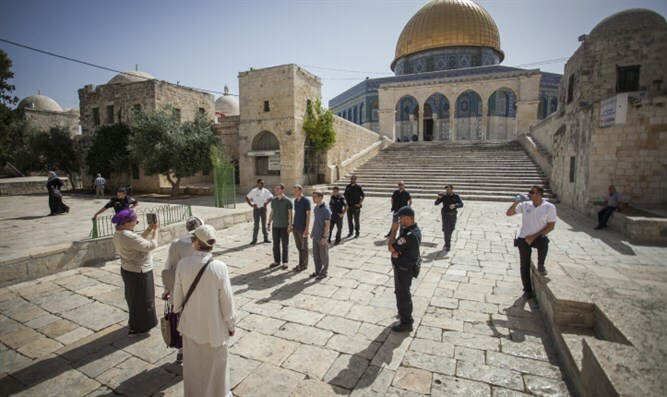 MK Smotrich calls on PM to respond to violence by allowing Jews to pray at their holiest site, punish PA for terrorism, and build in Yesha. MK Bezalel Smotrich (Jewish Home) called Monday for the construction of a Synagogue on the Temple Mount in response to the brutal terrorist attack in Halamish Friday night. "The Zionist response would largely be to make the other side understand and feel that they have lost. They must understand that they gain nothing from terrorism. They are the only ones who will lose, and this will happen on three levels," Smotrich told Arutz Sheva. MK Smotrich listed what he considered to be the Zionist response to the campaign of incitement and terror against Jewish rights on the Temple Mount. "I would set up a Synagogue on the Temple Mount today, this morning. If someone thinks that through terrorism, violence, and the massacre of a family he will push our sovereignty back, then - if I am the Prime Minister - this morning I would close the Temple Mount to Arab prayer and establish a Synagogue for Jews. And if the terrorism continues I would close the mount to Arabs and there will be only Jews there." Smotrich continued: "Secondly, I would exact a very steep price from the population in Judea and Samaria. The big lie of the Defense Minister is 'let's separate the population from the terrorism.' In the real world this is a lie, because this terrorist, the person who carried out the Shabbat night massacre, was a 'civilian' until the moment before the massacre. He did not belong to the larger Hamas infrastructure. He grew up within a world that produces terrorists, an infrastructure of incitement and which support the payment of salaries [to murderous terrorists], and an atmosphere that encourages these [acts of murder]." "During the past five or six years, when Netanyahu created a policy of quality of life and freedom of movement, he greatly improved the quality of life of the Palestinians. Today this allows us to enact a heavy price and to demonstrate the price of terrorism. If you are quiet, you will have a good life. If you commit terrorism, you will not have a good life. The third step Israel must take, according to MK Smotrich, is to build in Judea and Samaria. "Construction should continue. We should be systematic in our approach to this well-known matter. Sovereignty must be applied and hundreds of thousands of Jews should be brought to Judea and Samaria to demonstrate that a Palestinian state will not arise and destroy the hope that drives terrorism." In conclusion, MK Smotrich said that the goal of these three steps is "to convey a message: Terrorism will not only not bring you closer to your goals, it will distance you and you will lose it and it does not pay."